“The best Brownie on the Market” says TV Chef Lesley Waters. Milk chocolate brownie with coffee and almonds. Our best seller year on year. The chief ingredient in many brownies is sugar. Our chief ingredient is milk chocolate. 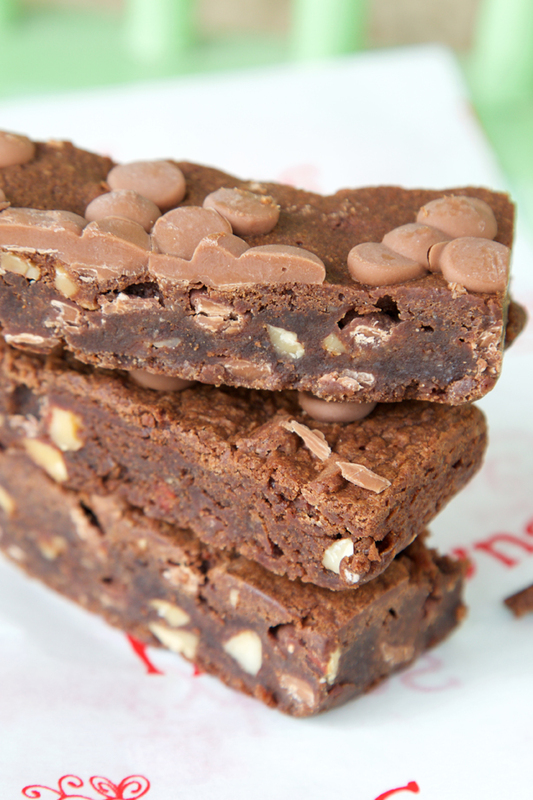 Our brownie is made with ground almonds, a naturally sweet ingredient allowing us to reduce the overall sugar content. The blend of milk & dark chocolate is 45% of overall contents, thus it does what it says on the wrapper: tastes full-on chocolatey. Great warmed up as a desert. Try serving with creme fraiche with a slug of kahlua stirred in. As a pudding, beautiful warmed through and served with almond milk custard. We're delighted that the Milk Chocolate Brownie is available to buy in John Lewis The Place to Eat and Waitrose. Gluten free. Suitable for vegetarians. Allergen information can be found here. Part of our Classic Range of well established favourites. "I don't know if I've ever done this, but I just wanted to drop you a line to say that your Milk Chocolate Brownie is pretty much the most delightful thing I have had the pleasure of eating in years. It is so moist and just melts in your mouth," S.G.
"I don't usually write things like this....at lunch time I popped in and got a sandwich and also decided to treat myself to one of your Milk Chocolate Brownies. I have never tasted anything so gorgeous in my life! I can honestly say I don't think I could ever eat another brand of brownie again as they just wouldn't compare. The texture is so perfect and the little bit of coffee makes the taste go wild in your mouth...in fact I'm drooling as I think about it," L.S. "OMG! Milk chocolate brownies. 1st gluten free that is moist and scrummy. I think I'm in love!! wow," K.M. "I had a gluten-free chocolate brownie at the café in Dobbie's Dundee and it was really lovely. Often gluten-free cakes are far too sweet - the Honeybuns one was exceptional. Thank you," F.M. "The tastiest brownie I've ever had! will definitely be ordering more :)," S.H. "Had one of your most divine chocolate brownies today at the Edwardian Tearooms, Birmingham Art Gallery. Simply the best brownie ever!," S.J.C. "Just had one of your gluten free choc brownies in the BA lounge and its the best I've had! (and I've tried a lot)," K.C. "I bought a milk chocolate brownie at my work place....I buy one every day now as I really love the taste! It's genuinely exquisite," E. A.